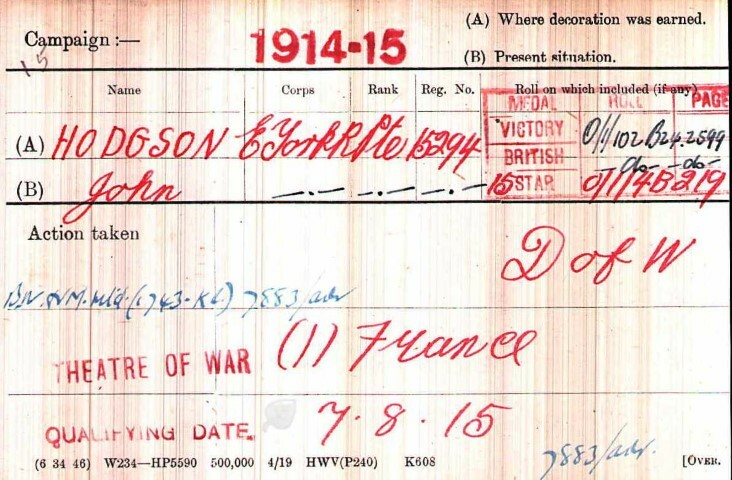 15294, Private John Edward Hodgson, 8th Battalion, the East Yorkshire Regiment died of wounds 20 July 1916. He was about 21 years old and is buried at Abbeville Communal Cemetery  and commemorated on the St. Helen’s Colliery Memorial Cottages, West Auckland War Memorial and the Roll of Honour, West Auckland Memorial Hall. All the family were born either at West Auckland or St. Helen’s Auckland. In 1901, they lived in the Square. By 1911, they lived at Peases Street which was one of the terraces which made up the Square. John’s mother Ann died aged 50 in 1906. The men all worked as coal miners, James worked a as a colliery bricklayer, Wilfred a hewer, Oliver a putter and John was a driver. John’s father James died 11 February 1916. By the end of the war, his brother George lived at Middlestone Moor, Fred at Crook, Wilfred at South Moor, Oliver at Fylands Bridge and James at High Etherley. Maria had married and her surname was now Rowett and she lived at Darlington, Mary (Davis) lived at Spennymoor and Lily (Lewis) was at East Howle. John Edward Hodgson attested 11 November 1914 and was given the regimental number 15294. He was 20 years 1 month and had worked as a miner. He was 5ft.4” tall, weighed 132lbs. had a fresh complexion, brown eyes and brown hair and was considered fit for duty. 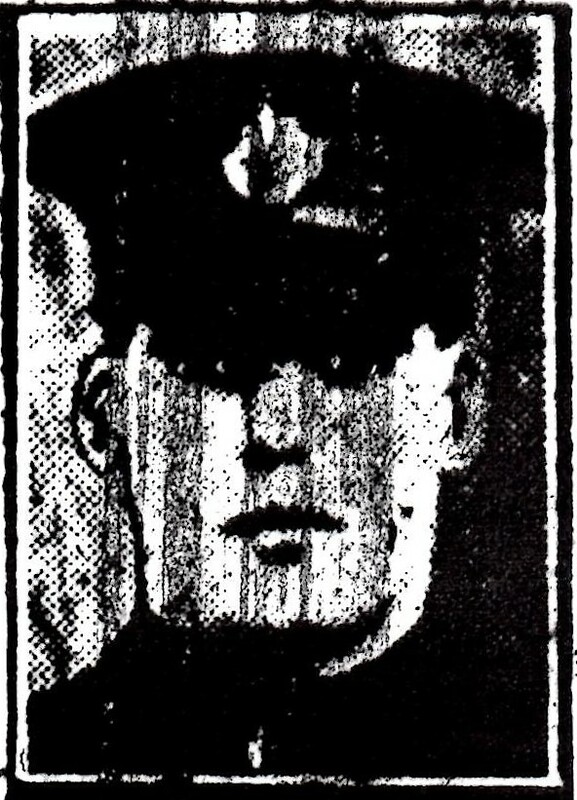 Private J.E. Hodgson was posted to the 7th and 9th battalions, East Yorkshire Regiment and served in France between 7 August and 3 December 1915 with 7/East Yorks. 4 July: marched to Cardonnette. 5 July: marched 14 miles to Corbies. 8 – 12 July: fatigue parties carrying ammunition to form the Brigade Dump in the Quarry. The fighting strength was about 20 officers and 800 other ranks. 13/14 July: left Carnoy for the Montauban area. 14 July: reached point of deployment, artillery bombardment took place and was lifted 6.45am. The assault on the enemy trenches was made but was held up by uncut wire. The enemy opened up with machine gun and rifle fire. Men returned to the point of assembly, others took cover in shell holes. 7.00am: machine guns and stokes mortars “got going.” 1/Royal Scots Fusiliers joined the battalion. 7.45am: reported that Bazentin was in the possession of the 9th Brigade. 8.40am: Colonel Forbes, 1/RSF arrived with reinforcements and took over command. 10.15am: patrol reported heavy fighting in enemy trenches. 10.20am: Bombers and 2 platoons RSF send to join the fighting in the trenches on right flank. 11.50am: Orders received that the position was to be taken at once at all costs. 12.15am: Bombing party of 2/RS appeared on the left. They advanced quickly and carried all before them as they advanced, our men joined in and the fight was over at once. 1.00pm: received orders to consolidate the position as soon as possible. 2.00pm: Re-organised Battalion. The strength was 3 officers and 100 other ranks and 1 Lewis gun. 14-20 July: The new position was held and suffered heavily bombardment, gas and lachrymatory shells. There were many casualties. 20/21 July: Relieved by the King’s Own Scottish Borderers. Another workman from St. Helen’s Colliery to lose his life in this action, serving with the 8/East Yorkshires was Private T. Neal who died of wounds in No. 1/2nd Hospital Field Ambulance 22 July 1916. 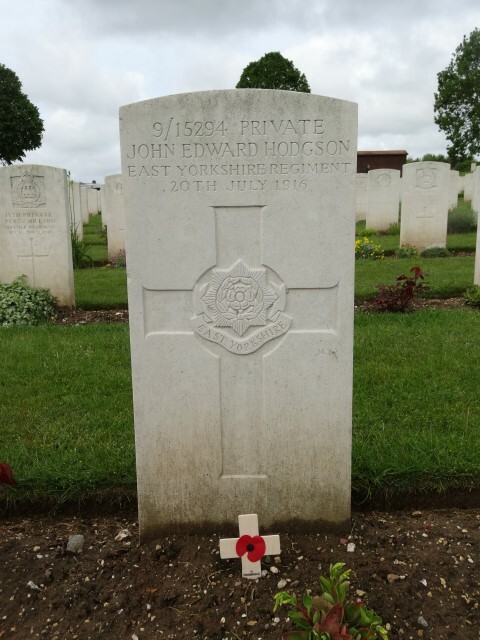 Private John Hodgson is buried at grave reference V.F.13, Abbeville Communal Cemetery, France. Abbeville was the Commonwealth HQ for lines of communication. No.3 BRCS, No.5 and No.2 Stationary Hospitals were stationed there at various times between November 1914 and September 1916. The cemetery holds 774 Commonwealth WW1 burials and the extension holds 1,754. Officers and Soldiers Died in the Great War. Note: Private T. Neal is recorded as serving with 9th Battalion and was the only soldier to have died on the 22 July but this is incorrect since he had been transferred to the 8th Battalion 7 October 1915.